San Diego is home to defense contractors General Atomics Aeronautical Systems and Northrop Grumman, the world’s largest and leading manufacturers of drones. General Atomics builds the Predator and Reaper drones. Northrop Grumman provides the software for a similar aircraft, the Global Hawk spy drone. These remotely controlled vehicles come with a hefty price tag — Predator and Reaper’s range between $4-$12 million and the Global Hawk’s cost about $35 million. With their high tech sophistication, drones have become the weapon of choice in fighting the U.S. occupations. San Diego drones on display. More than 7000 drones are ready to prowl the skies over Afghanistan and Iraq. The demand for drone surveillance and strikes has increased through the request of Secretary of Defense Robert Gates for $112.9 million in the next $708 billion defense bill. Last year, U.S. tax payers paid $489 million for 24 new Reaper drones and $554 million for the Global Hawk drones in the 2010 defense bill. San Diego residents can catch a glimpse of the Predator and Global Hawk drones at the AeroSpace Museum, but those in Afghanistan and Pakistan are not likely to have such casual contact. Drones scout over the two countries launching Hellfire missiles onto intended targets. Since July 2009, there have been 89 drone strikes in Afghanistan. In the first two weeks of January, six drone strikes took place. The strikes have escalated under General Stanley McChrystal to prevent civilian casualties. Though with the latest U.S. and NATO assault in Marja, 16 innocent civilians have been killed; pointing out that U.S. military intervention in the region is not the way to bring real and sustainable change. In Pakistan, it may never be known how many civilians have died as a result of U.S. 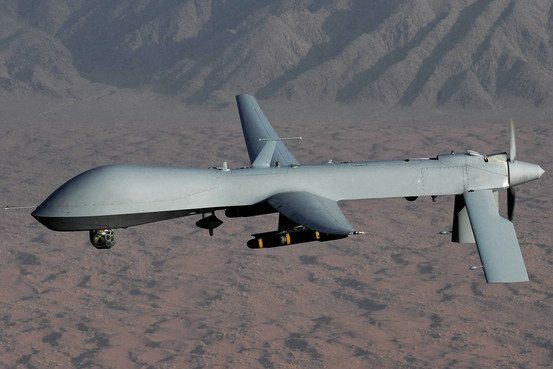 Predator and Reaper drone strikes, but there are estimates of hundreds of innocent bystanders who have perished in the attacks. Pakistani authorities released statistics indicating that in 2009, drone strikes had killed over 700 innocent civilians. January 2010 proved to be a deadly month with 123 innocent civilians killed. Latest reports, show that 18 missiles by eight drones killed 16 innocent people on February 2nd. 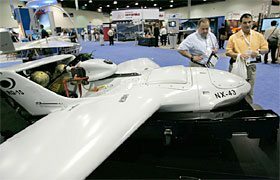 As many U.S. domestic programs suffer, drones and other unmanned aerial systems have taken a prominent role in the U.S. occupations and defense budgets with billions continuing to be directed toward research and development. Even though General Atomics and Northrop Grumman brought countless technical jobs into the community, San Diego along with many other cities has had their share of hardships. The civilian unemployment rate is at 10.1%; there are more than 160,000 San Diegans unemployed, and employers have lost roughly sixty thousand jobs. The school district is $87 million dollars in the red with threats of salary and program cuts. Over 7800 people live on the streets. According to Veterans Village of San Diego, 30-40% of San Diego County’s homeless are veterans. San Diego is the number one county recipient of Department of Defense spending in the nation. The economy is overrun and overspent by defense contractors such as General Atomics Aeronautical Systems and Northrop Grumman. Drones in warfare are made for surveillance and strikes, and contribute nothing to the U.S. economy. Money for non-military related jobs, education, housing and health care could easily come from the millions spent per day on the U.S. occupations of Iraq, Afghanistan and Pakistan. Join Activist San Diego, CODEPINK, Nevada Desert Experience, Peace Resource Center of San Diego and San Diego Coalition for Peace and Justice in a demonstration against the world’s largest and leading drone manufacturer, General Atomics. Demonstration, Street Theater, Die-In at General Atomics Headquarters (Makers of the Predator & Reaper Drones) will be on Wednesday, May 19 8-10am, at 3550 General Atomics Ct. San Diego, CA 92121. Parking is limited at the demonstration site so we will be organizing shuttles. How about both sides build a fleet of drones and robots and automatons and let them all fight instead of humans? That way it’s be like battlebots and would be far more amusing than actual people getting maimed. I guess one way to look at it is this way. How would you feel if you met a pilot that actually flew the aircraft over there and killed humans that way? I posted this on an earlier article a couple weeks ago. I used to be stationed at the Balboa Naval Hospital during my last tour before retirement and had the opportunity to talk to a young Marine who lost one of his legs just above the knee and part of this hand (don’t remember which side). His very own admission was something to the effect that if there was any justice in the world HE HIMSELF should be in prison for the things he took part in and even felt guilty about the fact that he was getting second chance in life but was taking advantage of it anyway (GI bill for college). I look at it this way. Whether or not we should be involved in the war we were in, we ARE in them until we are not. I feel very strongly those who are against our involvement in these wars(myself included) should not extend hostile feelings towards the people ware are actually participating in them. If any family member for friend of mind serving in the military had the chance to participate in it from the safety of doing it here at home, I would be grateful. If you ever do actually have a chance to meet one of these pilots, I would say give them the benefit of the doubt and judge them the same way you would judge anyone else in a random meeting (like at a bar). Amen to that there – lots of friends of mine bought into the Bushie rhetoric and enlisted post-9/11 – what can I say, we were naive teenagers fresh out of high school. Others had already joined up in peacetime, hoping to do a quick, uneventful tour of toilet scrubbing and score some college funds in exchange. Not a bad egg in the bunch, and none of them re-upped even in the face of intense badgering to do so. They served their country, and I think they deserve respect for that, and they stopped once they realized the shot callers didn’t really have their country’s best interest at heart (I think they deserve more respect for that). “Calling it your job don’t make it right.”- Coolhand Luke. Men and women in the military have chosen war, while we choose peace. Why should we remain quiet and give these people such respect? There is no such thing as a good war, or a good warrior. They are not my heroes. I cannot help but get a sick feeling in my stomach and a little throw up in my mouth when I see someone in camo. Protest the war, not the people participating in it. You’re entitled to your opinion but I find it very troubling. So tell me this. I assume you live in OB. Lets say you randomly meet some military person at a bar, you are automatically going to be hostile towards that person with out knowing anything else about them. People like you make ME SICK TO MY STOMACH. Not because you are against the wars we’re in (I am myself) but because you extend that feeling to the men and women who are participating in it. You’re a kid from a low-income neighborhood fresh out of high school, class of 2009. The economy is in shambles, your folks are having a hard time holding down a job. You didn’t have the grades or you don’t have the money to do college – the real world starts right now. Some Army recruiter is offering you three hots and a cot and a guaranteed paycheck, plus promises you the civilian sector is gonna look highly on your military experience when you get out and hit the job market again in a few years. You don’t want to go to war necessarily, but more likely you’re young, naive, and relatively ignorant in the realm of global politics. Maybe you’ve got a family member that served back in the day that everyone respects for their service and landed a relatively stable civil service job they rode out for a nice retirement. Free health care for life doesn’t sound like a bad deal, especially given the current state of that debate. You can take this path to the land of milk and honey that the recruiter is offering, you can get a job flipping burgers for 20 hours a week and live with your parents who’ve been ready to have you gone for the last half decade, or you can find some hustle like slinging drugs or robbing gas stations. I can sit atop my high horse after having been one of the lucky ones that made it in the real world due to a lot of opportunities I got (that I didn’t necessarily deserve more or less than other people like me) and tell this kid that America isn’t the utopia in the eyes of the rest of the world that we were raised believing to be true. That they should take a moral stand against militancy that they don’t have the life experience to understand taking. But can I really bring myself to hate them because they were duped into taking what appeared to be the most desirous of a handful of unenviable paths? I think they’ll figure that out on their own, most do. “…Dan, the company man, felt loyalty to the Corps. the weaponry and chemicals were for national defense. ‘Cause Danny had a mortgage, and a boss to answer to. It’s a back-door draft, don’t ya think? You know, I was thinking about what you said earlier today. There is probably nothing I could say that would change your mind set about military members. What I will say to you now certainly won’t change your mind. I figure it this way. The views you have bother me but you know what is kind of cool about the whole thing? Your tax dollars pay my salary (assuming you have a job). They paid my salary and benefits when I was active duty and they pay my retirement pension now. Not only that but it pays my salary as a Federal Department of Defense employee. I would love to run in to you or someone like you sometime so I can see the disgust in your eyes and taunt you with it a little. jb, I wonder what you know, who you are (no, I don’t want to know your address or how to find you), what you’ve experienced. People make choices, sure, but we don’t all have the same options, upbringing, or knowledge; further, not everyone who has personal experience feels all that damned good about it. I hope I don’t run into you. From your comment, you sound way too self-righteous for me to share with. Let’s face it: Drones are the ones taking all the risks, NOT the ‘pilots’ with joysticks. These shiny metal birds fly into dangerous situations every day to protect our freedoms. And they should be awarded medals for bravery just like any other soldier. If a drone was ever shot down (God forbid) I think it should be given a proper military burial. Back in WW-TWO when Hitler sent those V-2 rockets into London did he say he was just trying to kill a few evil English MASTERMINDS? One thing we tend to forget is other nations are also building up their own drone inventories by the thousands, too. At some point, drones could very well be patrolling our skies for foreign masters, making sure we don’t try to start any insurgencies. Personally, I think drones are like land mines and nukes…nasty little creations that, eventually, we end up trying to stuff back into Pandora’s box. Did you happen to catch this interview with Chalmers Johnson? There is no empirical evidence that supports you claim of many ‘hundreds of civilians’ killed by the drones. I suggest you learn about how they operate and the technology associated with them. Many of the drones are simply used for recon, for subsequent operations. There have been, no doubt innocents killed, but the number of collateral damage inflicted by the US is not significant. Perhaps if the governement would have authurized proper tactical force from the beginning, the wars in Iraq and Afghanistan would be over by now, instead we plod along with no clear objective or exit strategy. Obama has done nothing to change and continues to push the same big party agendas. Older Article: Another earthquake: I just felt the house shake a bit.